Man, do we love the camera on our iPhone. The convenience of having an outstanding camera with us at all times allows us to capture every moment from a creative perspective. The ever-increasing megapixels and sensors present us with more photography opportunities than ever. Whether you use your iPhone camera to keep your Instagram fresh or you use your camera phone for professional projects, there are many ways to up your photography game using editing apps. There are hundreds of photo editing apps for your phone, which we have learned can be overwhelming. It is difficult to sort through hundreds of apps and reviews, only to download one and find out it is terrible. Not to mention, some are pricey. You don’t know what you are getting until you have taken the time to download it and try it out. We have compiled a list of our favorite photo editing apps so you don’t have to scour the App Store searching for exactly what you need. Some are great for portrait photography and editing, while others are great for removing objects and making big changes. Camera + has been around for awhile and has had time to improve and make changes to the app. The app is user-friendly and works well with the features of the iPhone camera. This app offers a wide range of exposure controls. Our favorite feature is that the Raw Shooting is compatible with Flash and you can edit in depth. The flash features are great, they offer continuous flash and frontal flash. The 6x digital zoom is also great. Camera+ offers a free version, but we suggest spending the extra $2.99 for the updated version, it is worth it. Snapseed is an all-purpose photo editor with a ton of features. The app has the capability to smartly select areas for retouching making it easy and fun to use. Snapseed offers portrait enhancement, double exposure, color sharpening effects, and a ton of beautiful filters. Surprisingly, this app is offered for free with no in-app purchases. Afterlight 2 is special because it offers both basic editing features as well as advanced features that other photo editing apps do not have. This app allows you to edit curves and selective color, as well as fine-tuning and adding layers. Many reviewers commenting that this app is great for adjusting and changing the mood dust textures and light overlays. This app can be purchased for $2.99. There is no subscription fee and no in-app purchases. VSCO is popular because it helps you create an old-timey, vintage feel for your photos. We have been using it for years now, there are so many features and packs to explore. The app also has basic editing tools, including cropping, color, sharpness, and exposure. The app also is great for editing videos and emulating film in your photos. This versatile app is free but has a ton of in-app purchases and add-ons you can explore. Englight is a bit more complicated because it offers more professional-style edits and features. We particularly like this app because it has a graphic design aspect that allows you to be more artistic with your photos. Enlight offers very selective control with its features, especially the masking and exposure features. The app won an Apple Design Award in 2017 for its amazing interface and abilities to make a simple edit or create a digital masterpiece. You can purchase Englight for $3.99. 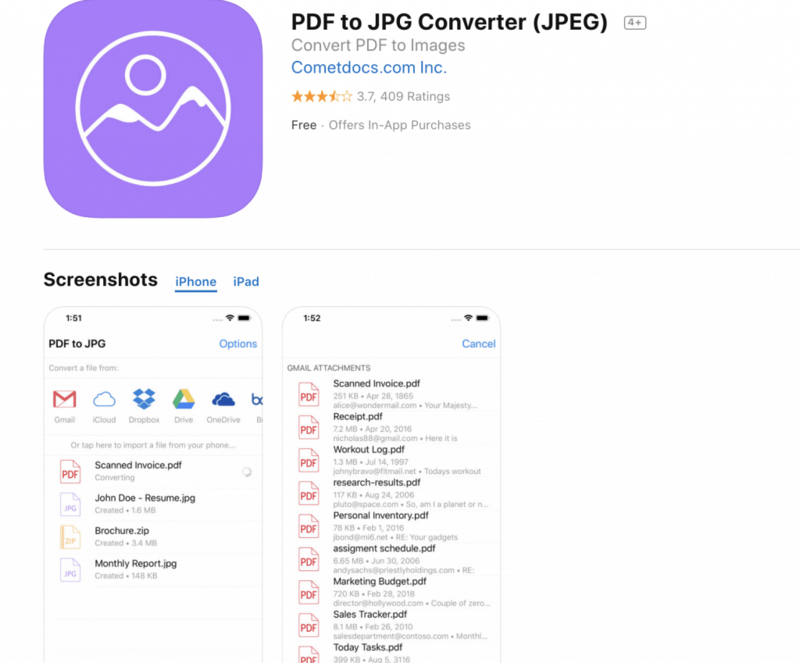 PDF to JPG Converter recently launched their new improved version of PDF to JPG Converter, following their users’ feedback. Here are some of the most notable features: No limitation on file size and the number of files you can convert, view and share ZIP archives from within the app and convert PDFs directly from Gmail, iCloud Google Drive, Dropbox, and others.